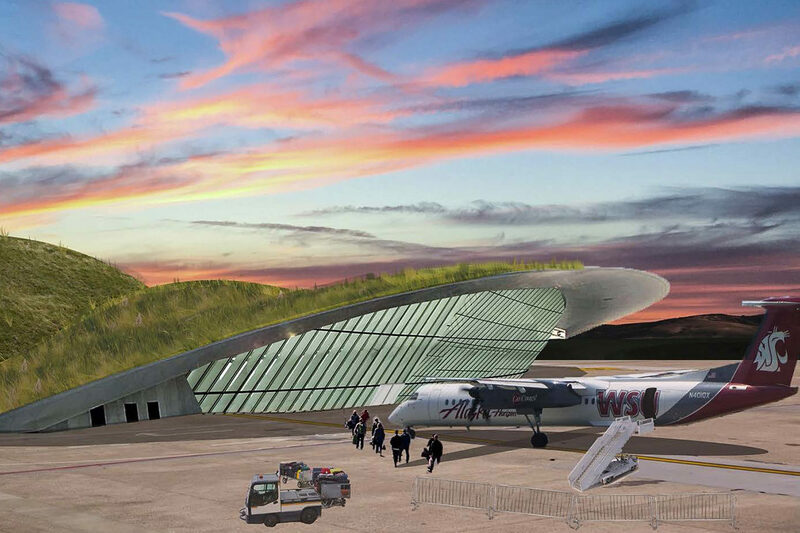 Proposed design at Pullman‑Moscow Regional Airport. Students learned about the history of Pullman and its environment, conducted on‑site field research, and then presented their ideas to the public. They also gained real‑world experience and learned how to serve a community, Austin said. The project continued in a junior‑level class as students developed ideas to transform Pullman. Ideas ranged from stringing a gondola system to improve links between downtown and campus to creating a new airport terminal that complements the beauty of the rolling Palouse landscape. The students presented their final ideas at a recent workshop at the Pullman Depot Heritage Center. “We take the issue and build images and descriptions of those, then share those with the community and WSU. It’s a fun way to show people what we can do in the future and can interest people in discussions about what else can be possible,” Austin said. 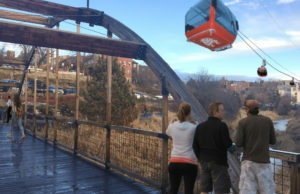 Proposed design of a gondola to improve links between downtown and campus.